This is the first article in a series about leading prayer. When Catholics pray, we are often surrounded by reminders of who we are. At Mass, we can easily identify the current liturgical season or feast from how the sanctuary is decorated, the color of the priest’s vestments, the hymns we sing, and sometimes from the aroma of incense. We are accompanied in our liturgical prayers by statues of the saints, Scripture stories in stained glass, and the Stations of the Cross. These sights, sounds, and smells stimulate the senses—they are the “smells and bells” that are part of our Catholic DNA. In his book Beyond the Catechist’s Toolbox, Joe Paprocki has suggested that faith formation class should be “more like Mass.” This is especially true of prayer during sessions and during catechist or parent meetings. When we pray in a space other than church, it is essential to include symbols, sacramentals, images, and more. Since many children and parents don’t regularly attend Mass, they need signs, actions, and symbols of liturgical and devotional life. 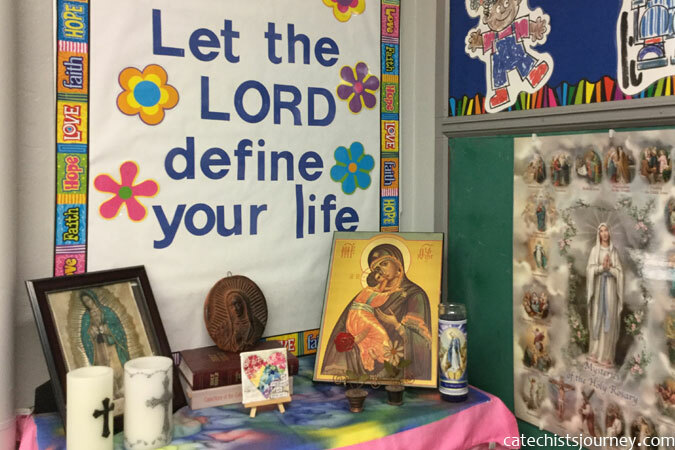 Catechists and leaders can help families develop their Catholic identity through a classroom prayer space that shows Catholic communal prayer is an embodied action. The environment for prayer should be simple, dignified, and uncluttered. Start with a small table or counter that is decorated with a piece of fabric. You can use fabric that matches the liturgical color of the current season or feast. While the fabric doesn’t always have to be plain, keep prints subtle and related to the season of the calendar year (for example, a print with leaves would be appropriate during fall; one with snowflakes would be appropriate during winter). Build your classroom prayer space by placing other essential elements on the table, such as a Bible, a cross or crucifix, and a candle. (Be sure to use a flameless or enclosed flame candle if local fire codes require it.) Use a well-illustrated Bible storybook for primary age students and a New American Bible (the Bible from which the readings for Mass are taken) for teens or adults. Enthrone the Bible by propping it up and leaving it open. 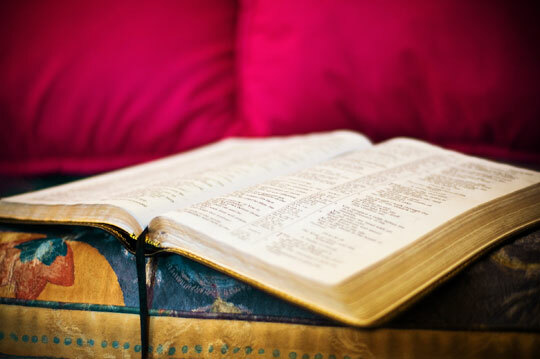 When enthroned in your prayer space, a Bible (or Lectionary for Mass) should always remain open to remind us that “the Word of the Lord is living and effective.” (Hebrews 4:12) An open Bible invites everyone. Embellish the space by adding decorations. You do not want to overdo it—keep decorations simple and tasteful. For example, you may want to include an image or statue of a saint or a few natural objects, such as leaves or stones. Grapes, bread, a pottery goblet, or plate can be included. (A goblet and plate are especially good ideas for those who are preparing to celebrate First Holy Communion.) Photos of beloved dead relatives would be appropriate during November. Finally, be sure to use the prayer space. At the beginning of class, process to the prayer space and form a circle or semi-circle. Lead the procession by carrying the Bible overhead. Once you have gathered in the prayer space, introduce the reading using liturgical language: begin by saying the words “a reading from…” and close it with the words “the Word/Gospel of the Lord.” Enthrone the Bible in the prayer space (leaving it open) and then process back to regular seating. You don’t have to be an interior decorator to create a beautiful prayer space. Stick to the basics. When you use liturgical actions and symbols in class, you enrich faith formation and connect participants to the Mass and reinforce their Catholic identity. Encourage catechists and families to do this at home by sharing these guidelines to create their own home oratory for prayer. Such prayer spaces will help families see their homes as domestic churches. 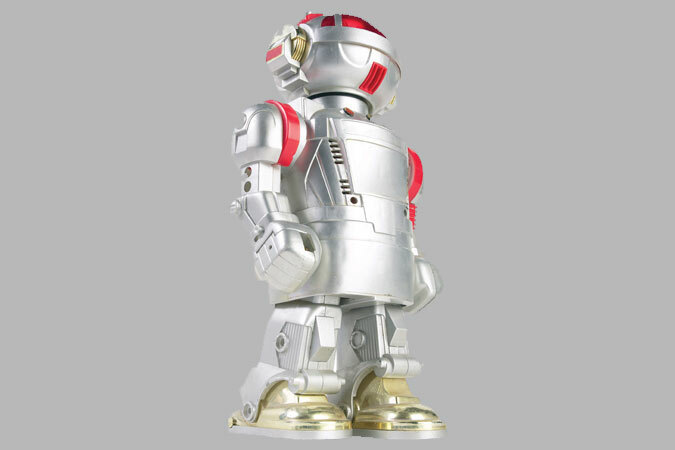 Will Robots Replace Catechists? Can They?